1.1 How to Stop, Cancel, Deactivate GP Social Pack 300 MB Facebook Internet 18 TK Offer? Hello Dear, Welcome to GP 300 MB Facebook Pack 18 TK with 28 Days Validity. All the Grameenphone connection users are eligible to enjoy GP Facebook Package 300 MB Internet 18 TK for 28 Days. 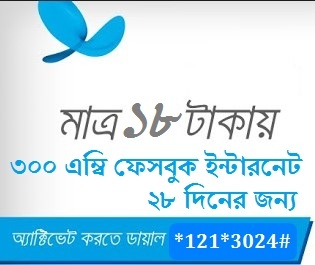 If you are Grameenphone Prepaid or Postpaid customers and searching GP 1 month Validity Facebook Internet Package in low price/cost, we recommend you First check the GP 300 MB Facebook internet Package at 18 TK Offer Details Information. To activate GP 300 MB @ 18 TK Facebook Internet Package, Prepaid and postpaid customers need to Dial USSD Code *121*3024# or Type a Message. Go to the message option, then Type “fb28 on” and Send an SMS 5000. VAT + SD + SC including in 18 Taka. The validity of GP 300 MB Facebook Internet Offer 28 Days. Customers Can Use this Grameenphone 300 MB Facebook Package both 2G/3G area networks and uses time 24 hours. To check GP 300 MB FB Internet remaining balance, Customers need to Dial *121*1*4# or Type “VIEW” Send a Message 5000 (charge free). Customers can activate this GP Social 300 MB package as many times as they want. The GP 300 MB fb Internet at only 18 TK Package is a Regular GP Internet Package. How to Stop, Cancel, Deactivate GP Social Pack 300 MB Facebook Internet 18 TK Offer? To Cancel, Deactivate, Stop GP Social Pack 300 MB Facebook Internet 18 TK Offer, just Type a Message. Go to Message option, then Type “STOP” and send 5000. Thanks for staying with us a long time and visiting GP 300 MB Facebook Pack 18 TK with 28 Days Validity article. If you have any confusion or question or want to know more about the GP 300 MB Facebook Offer, Just comment here. We reply as soon as possible with a correct answer.